The Volcano Vaporizer was the first and is still one of the most popular desktop vaporizers on the market today. It was Markus Storz, a graphic artist that began the process of inventing the iconic machine in 1996. By 1998, a patent on the refillable balloons was obtained. In 2000, the very first Volcano vaporizer hit the market to great acclaim by industry experts and the vaping community. 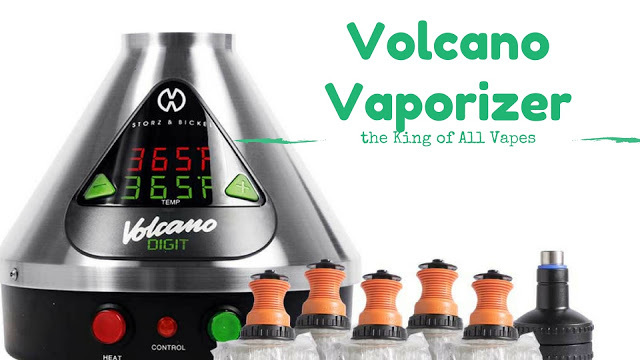 In 2002, Jurgen Bickel joined the partnership and STORZ & BICKEL GmbH & Co KH was founded to market the Volcano. By 2003, the classic Volcano vaporizer hit the American market. This led to the creation of STORZ & BICKEL America, Inc. in Oakland, California. In 2007, just seven years after the classic Volcano was released, Storz & Bickel innovated yet again by releasing the Volcano Digit. It is their first electronically-controlled vaporizer. The Volcano is durable, easy-to-use, and one of the most highly-rated desktop vaporizers on the market. Few users have reported issues with breaking down. There are still many of the first models off of the production line still in use. That alone says much about the durability and longevity of the Volcano brand vaporizer. Crafted in Germany with food safe, flavorless, and heat resistant materials, the Volcano is built to exceed the demands of professionals and connoisseurs alike. Whether used daily or only brought out occasionally to enjoy with friends, the Volcano vaporizer is built to last. While there are many desktop vaporizers on the market, many of them cheaper, the Volcano vaporizer is the original and the best. Purchasing it will cost between $380 and $600 depending on whether you choose the Digit or the Classic. The Volcano Classic is very basic in its design with an analog temperature control knob on the front of the device. The Volcano Digit gives you more control, with a digital temperature display that allows you to set a precise temperature. With the Digit, you can also choose between displaying temperatures in Fahrenheit or Celsius. Since both are capable of reaching the same temperatures, the difference boils down to pure preference. If you have a need to be dialed into a precise temperature, then the Digit is the model for you. If you are fine with a knob controlled temperature and less accuracy, the Classic will suffice. The temperature range is between 130 and 226 degrees Celsius. This means it can be used with a wide variety of products. Another way that the Volcano vaporizers allow for a customizable experience is in the offering of the solid valve and the easy valve options for filling balloons. The solid valve offers durable, heat-resistant, stainless steel and plastic. It offers you a choice of balloon size. Materials for extra balloons can be acquired very inexpensively. The con is that this model requires cleaning on occasion. If you’d rather have no cleaning and no maintenance, then the easy valve design is for you. You just toss the used valve and replace it with a new one as necessary. The drawback to this design is that there is a pre-set balloon size. Up front, both cost the same. However, with the easy valve design costs more in the long run with having to purchase more valves to replace the used ones. On the other hand, the solid valve requires you to take it apart and clean it periodically. Both the Digit and the Classic are available in your choice of easy valve or solid valve. If you order the solid valve, you will receive the vaporizer, an air filter set, an herb mill, and a user’s manual. Ordering the easy valve gets you everything you need to get started, including the vaporizer, valves and a few replacements, balloons with a mouth piece, and an instruction manual. Though the initial cost is somewhat high and definitely not for the casual smoker or person who only vaporizes occasionally, the Volcano is one of the industry-leading vaporizers. Deciding between the Classic and the Digit comes down to personal preference. Choosing between easy valve and the solid valve models also comes down to personal choice. Yet no matter your choice – Classic or Digit – easy valve or solid valve, the Volcano Vaporizer is a worthy investment for the daily smoker or those who demand quality in all they buy.